Donald Trump has said Florida’s election recounts should be called in favour of Republicans as “an honest vote count is no longer possible”. A recount is under way for the governor and senate races as both have fallen within a margin of 0.5%, triggering the recount in accordance with Florida law. Mr Trump and Republicans have claimed voter fraud without offering evidence. Florida has imposed a machine recount deadline on Thursday, but some mail-in votes have yet to arrive. The two ballots for senate and governor are among the most important yet to be decided. 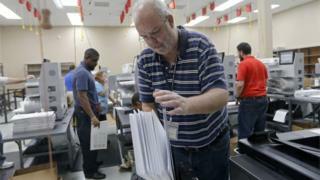 The president urged Florida to go with election night results that saw both Republicans ahead. He also called the ballots “massively infected”, but did not explain any further. Mr Trump and outgoing Florida Republican Governor Rick Scott, who is standing for Senate, have both accused Democrats of trying to “steal” the elections without providing evidence to back up allegations of voter fraud. Mr Trump’s push to end recounts comes as some ballots, including from military serving abroad, have yet to arrive. Military and overseas citizens have until 16 November for their ballots to be counted, as long as they are postmarked by 6 November. The statewide recounts are expected to take several days, but analysts say possible legal challenges mean it could take weeks for the winners to be confirmed. Florida Secretary of State Ken Detzner has ordered that all 67 Florida counties complete machine recounts for the Senate and gubernatorial races by 15:00 local time on Thursday. If a machine recount shows a difference of 0.25% or less between the candidates, the state will proceed to a hand recount that must conclude by 18 November, local media report. What has happened in Florida? In the race for Florida’s Senate seat, unofficial results revealed a gap of just 0.15% between the votes for incumbent Democrat Bill Nelson and Mr Scott. 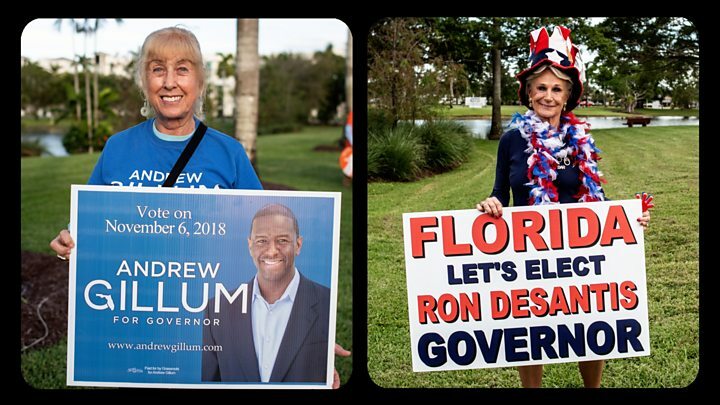 Democrat Andrew Gillum had already conceded the state governorship, but Ron DeSantis’s lead for the Republicans later narrowed to 0.41%. Mr DeSantis, however, insisted that the results were “clear and unambiguous, just as they were on election night”. “It is important that everyone involved in the election process strictly adhere to the rule of law which is the foundation for our nation,” he added. Mr Trump had earlier said there was “a lot of dishonesty” over contested votes. Some candidates have already launched legal action. Mr Scott, who claimed victory on Tuesday, is suing officials over an election recount, while Mr Nelson is suing over uncounted ballots – and there have also been a number of protests outside the elections office. Mr Scott called on sheriffs in every county to closely monitor the recount process, tweeting: “We will not let unethical liberals steal this election! In one of his three lawsuits against election overseers, Mr Scott has asked a judge to impound voting machines and ballots when they are not in use. Mr Nelson responded to the legal action in a statement on Sunday, saying his rival, the state’s outgoing governor, was making “false and panicked” voter fraud claims because he was afraid of losing. “If Rick Scott wanted to make sure every legal ballot is counted, he would not be suing to try and stop voters from having their legal ballot counted as intended,” said the Democratic incumbent. Authorities have meanwhile shot down a conspiracy theory about ballot fraud. Florida Senator Marco Rubio was among those who retweeted a photo showing a box labelled “provisional ballots” found at a school, raising concerns about possible foul play. But election officials stated that the box contained only supplies. What else did Mr Trump say? Mr Trump told reporters on Friday, before leaving for Paris to commemorate the 100th anniversary of the end of World War One, that he believed that Mr Scott had clearly won the election. The president said he would send his lawyers to Florida “to expose the fraud”, calling the Nelson campaign’s recount lawyer Marc Elias an election stealer. Florida has a history with close elections. In 2000, George W Bush and Al Gore faced an impasse with the presidential vote hanging in the balance amid weeks of legal wrangling. Mr Gore’s fate was finally sealed by a US Supreme Court ruling that said in essence that time had run out for recounts in the crucial state, granting Mr Bush the presidency. In Georgia’s gubernatorial election, Democrat Stacey Abrams is refusing to concede in her race against Republican Brian Kemp. An ongoing tally has whittled Mr Kemp’s lead slightly to under 60,000 votes, the Atlanta Journal-Constitution reports. In Arizona, another tight senate race has yet to conclude between two US congresswomen – Republican Martha McSally and Democrat Kyrsten Sinema. With mail-in votes still being counted, Ms Sinema had widened her narrow lead to more than 30,000 votes by Sunday (1.4|%), US media report.